REVITIVE Medic helps you keep active so you can keep doing the things you love. It uses clinically proven Electrical Muscle Stimulation (EMS) to stimulate the calf muscles - actively improving circulation, relieving swollen or painful legs and reducing muscle weakness. For a limited time only the REVITIVE Medic is available for £249.99 (RRP £299.99 – save £50)! 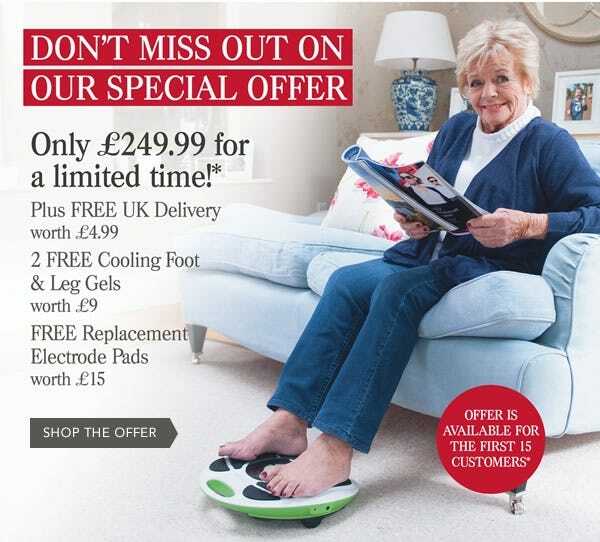 Plus you can get free delivery (UK standard) worth £4.99, 2 free Cooling Foot and Leg Gels worth £9 and free Replacement Electrode Pads worth £15. This offer is available for the first 15 customers and is only available whilst stocks last. Terms apply*. You can also claim VAT Relief (and save an extra £41.66) if you have been diagnosed with a long-term illness or disability. Terms apply**. To redeem this offer, simply add the 'REVITIVE Medic + Two Cooling Foot and Leg Gels & Replacement Electrode Pads Bundle' (RTMEBGP2) to your basket and proceed through the checkout process. Free delivery (UK standard), two Cooling Foot and Leg Gels (RFLG2) and REVITIVE Medic - Replacement Electrode Pads (CBPRX) will be automatically applied to the order. Offer available for the first 15 customers. Whilst stocks last. This offer expires at 4.00pm on Friday 25th May 2018. No offer code is required. Click here to view the REVITIVE Medic + Two Cooling Foot and Leg Gels & Replacement Electrode Pads Bundle' (RTMEBGP2). Cannot be used in conjunction with any other offer. Offer applies to in-stock items only. UK orders only. We reserve the right to withdraw this offer at any time. Individuals who are chronically sick or disabled can claim VAT Relief on products shown with "without VAT" prices. Click here or ring 01458 447275 for details.